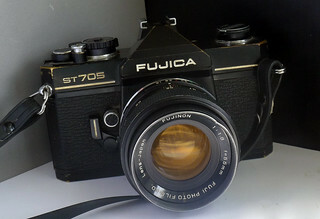 Fujica ST705 with 28mm f/3.5 lens. 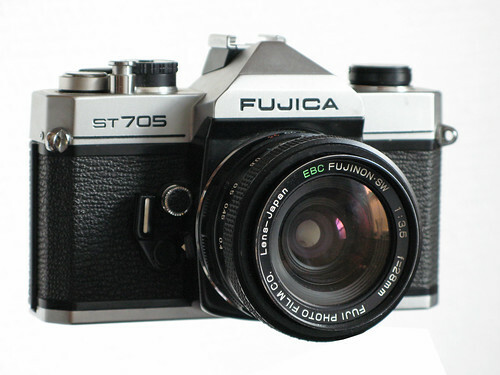 The Fujica ST705 is a fully-manual single-lens reflex camera first produced in 1976, using a slightly modified variation of the 42mm screw lens mount. The ST705 has center-weighted, through-the-lens, open aperture metering, activated by a half-press of the shutter button. Fuji lenses have a mechanical coupling between the lens and the camera body that permits this. There is a needle in the viewfinder that indicates over- and under-exposure. The camera's cloth focal-plane shutter has an unusual top speed of 1/1500 sec, then 1/1000, then down to a second in one-stop decrements. The flash sync speed is 1/60. 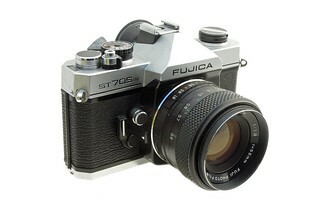 The ST705W is a later variant of the ST705, modified to accept a motor drive (identical to the one available for the AZ-1). ↑ According to Andrey Bliznyuk and Chris Eve. This page was last edited on 21 May 2017, at 00:52.